This is probably one of my favorites things I’ve made recently. Leading up to the Superbowl, I couldn’t figure out what to make. Whatever I ended up making, I had to transport it to my cousins’ house about an hour away… so it had to be something that would work being served at room temperature. I, literally, did not decide until the morning of… when I stumbled upon a recipe like this online. If you know what a planner I am, you’ll know how crazy I was going. In the end, I made these Blackberry Crumble Bars and homemade hummus as an appetizer. 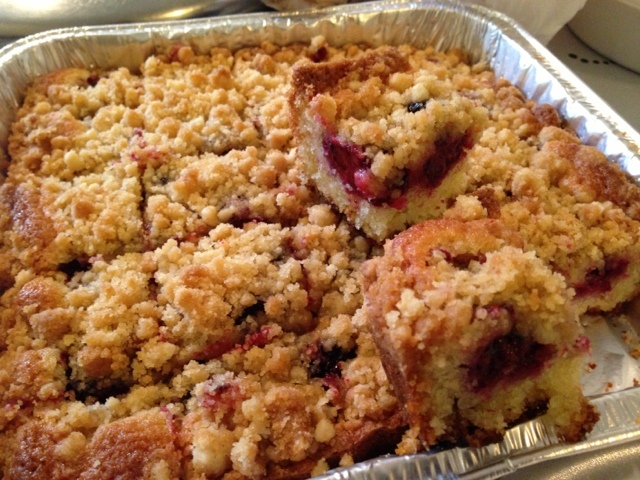 Both turned out great, but these Blackberry Crumble Bars were something else. Absolutely delicious, and I know I’ll be making these again soon. First, preheat your oven to 350 degrees. Take an 8-inch square baking pan, and spray it with non-stick cooking spray. Since I was transporting it, and for easy clean-up, I just used an 8-inch square foil pan. Then make the crumble topping: in a bowl, whisk together your 6 tablespoons of melted butter, 1/2 cup of brown sugar, and 1/4 teaspoon of salt. Then add in 1 cup of flour, and mix with a fork until moist crumbs form. At this point, refrigerate the crumble topping until you are ready to use it later on. Now, in a separate bowl: whisk together the remaining 3/4 cup of flour, 1/2 teaspoon of baking powder, and the remaining 1/4 teaspoon of salt. Then, set this aside for a moment. In a large bowl, using an electric mixer, beat together your [softened] butter, confectioners’ sugar, and vanilla. Then, add in your 2 eggs. At a low speed, add in your flour mixture [from step three]. Once everything is incorporated well, spread your batter evenly in your pan (that is sprayed with non-stick cooking spray). Then add your blackberries, evenly, on top. Finally, evenly sprinkle your [chilled] crumble topping that you made earlier [step two]. Bake, in your preheated oven, until it is golden brown, which will take about 40 to 45 minutes. Let it cool completely in pan, before cutting into 16 squares. These look fabulous. How can you go wrong with a recipe like this? I just pinned it so I can come back again and again! Thanks Krista! Definitely make this soon — it&#39;s absolutely delicious!